It looks like an aviator’s nightmare, but this Navy job is the fastest – and slowest – plane in the air. THE Navy has a flying Flapjack, and brotherâ€”it can fly! It all began on a day in November, 1942, when the doors of the Vought hangar opened and test engineers trundled out a queer, saucer-shaped object on two long, stilted legsâ€”and claimed it was an airplane. The V-173, they called it, and gave credit for its design to an aeronautical engineer who had been active in NACA research and had recently joined the staff of Chance Vought: Charles H. Zimmerman. The test pilot, Boone Guyton, climbed the ladder that led to the small door under the nose, and entered the pilot’s nacelle. The two huge, three-bladed propellers, protruding from the sides and looking more like helicopter rotors mounted vertically than conventional “props,” started turning. With its nose pointing into the sky at a steep angle, the Flapjack flew. Not much has been told about that first flight. The plane’s first performance did not cause a great sensation among the press at that time. The world was at war and there were many more important events happening in the skies to take the headlines. This new “crate” was just a bad dream, too radical a departure in aircraft design to be taken seriously. Even military censorship didn’t know exactly how to handle it. Photographers shot some pictures; these were published and soon forgotten. A couple of years later a new, slicked-up model was announced, bearing the Navy insignia and the designation XF5U-1. Nothing much was said about it. No mention of a test-flight was made. A couple of “hangar” pictures found their way into the newspapers and then the Flapjack faded from view, quickly smothered by warfront news. The Flapjack wasn’t scrapped; it is potentially the world’s most versatile airplane. All attempts to obtain information from its manufacturer and the Navy on its present status and performance have met with blunt refusals. The following facts have been gathered for you from reliable sources. Read them over and take your hat off to the slickest thing in the air! The basic wing plan of the plane is a circle designed as an airfoil to obtain lift from the air, at the same time serving as fuselage to house the pilot and engines. The large propellers are tractors, driven by fuselage engines with which they are connected by a gear-and-shaft arrangement. They turn at approximately 1/5 the speed of the engines. The propeller shafts project forward from the sides of the wing, positioning the propellers so that their airflow is continuous over the wing. A conventional wing “stalls” (loses lift) when the airflow over its surface, caused by the travel of the wing through the air, is broken (burbles) at slow speed. In the Flapjack, however, since the airflow over the wing is not caused by its motion but by the propellers, the airflow remains unbroken and lift is maintained even at slow speed. Although the actual aspect ratio of the wing (span divided by width) is less than one, the effective aspect ratio is approximately four since the propellers rotate against the wing tips, maintaining flow here also and increasing the effective span of the wing. In a model utilizing a higher horsepower engine, such as a gas turbine, to turn the propellers, it is possible for the wing to point its nose straight upward into the sky and hover like a helicopter. Articulated blades, like those on a helicopter, maintain control for vertical ascent and descent. What a plane for a backyard airport! The vertical control surfaces of the plane consist of twin fins and rudders, mounted on the rear of the wing, each pair being in the slipstream of a propeller. Two horizontal control surfaces extend from the sides of the wing near its trailing edge. These serve both as elevators and ailerons and accordingly are called “ailevators.” They rotate together when functioning as elevators, and differentially when functioning as ailerons. The V-173 was a wood-and-fabric ship, single place, with 16-foot, three-bladed propellers powered by two 75-hp. engines. In its tests it new as slowly as 20 mph. and as fast as 100 mph., and could land at a 45Â° angle at a speed under 20 mph. Its propellers turned over at about 600 rpm. at take-off and 450 rpm. at cruising speed; compare these with the take-off speed of 2,300 rpm. or more and cruising speed of 2,100 rpm. in conventional aircraft. It carried long, fixed landing gear which, no doubt, held down its top speed. The extreme length of the gear was necessary to hold the propeller tips clear of the ground, however. This explains the high angle at which the Flapjack has to hold her nose on take-off and landing. The blue XF5U-1 is similar in design to the V-173, but with 19-foot, four-bladed propellers. It is all-metal with fully retractable landing gear and two Pratt-and-Whitney R-200-2, 1,800-hp. engines, so geared that one engine can turn both propellers in the event of failure of the other. Its reported speed range is from 40 mph. to 425 mph. ; with water injection its top speed is said to reach almost 500 mph. In the future it is planned to install a single gas turbine in a nacelle behind the pilot’s cabin. With this single power plant operating both propellers, it should be possible for the Flapjack to hover at 0 speed and reach well over 500 mph. With a jet or rocket engine and the pilot in a prone position to reduce the thickness of the wing, the Flapjack offers a sure bet to lead the field in the race to smash the supersonic barrier. The air resistance to a plane’s flight caused by all parts of the plane which do not contribute to its lift is called “parasite drag.” In such a jet wing there would be no such resistanceâ€”no extended landing gear, no engine drag, no fuselage. The only resistance would be caused by skin friction of the wing’s surface. Of course, without propellers the hovering ability of the plane would be lost. So don’t be amazed when one of these days you hear a whistling sound from the sky and see a blurred, circular object scaling across the heavens at a speed never before attained by man! It will be the Navy’s Flapjack, the XF5U-1, breaking through another frontier in aviation’s history. The Navy fell out of love with the XF5U-1 as well http://www.voughtaircra… cancelling the contract before this article made it to press. If it’s so great, why is it in a museum? It’s like a tilt rotor without the tilting. Rev 01: Two 75 hp engines. Rev 02: Two 1800 hp engines. Why, that’s nearly twice as much! Modern avionics would address control issues, if any. Would the community hangar be by the golf course or the baseball field? Actually 1800 vs 75 is 24 to 1 not “twice as much”. According to the specs on the Vought Aircraft website the XF5U-1 engines were rated for 1350hp and the V-137 was rated for 80 hp so that’s about right. It didn’t catch on mainly because it was intended as a tail sitter. That whole tail sitter concept was invalidated by the Convair XFY-1 the Lockheed XFV-1 and the jet powered Ryan X-13. Come on, FB38, doesn’t your PC have the ‘sarcastic’ font? Of course 1800 is way more than twice 75! But you have to admit, that’s quite a difference, as if Tim “The Tool Man” Taylor had said More Power! It still sounds like it would make a nice STOL. Tilt cabin instead of tilt rotors? Maybe the concept will be dusted off for the 21st Century. Sorry my sarcasm light is out as well. Forgive me, but my tenure on the internet has made me cynical and prepared to accept the worst. I’d love to see one of these made with current carbon fiber technology. Wouldn’t need to tilt the cabin, that whole hanging off the props thing is a non starter. Not enough market for private pilots to buy them tho.. and it’s impractical for hauling anything (picture a 50 passenger Flying Flapjack). Smithsonian link hasn’t been updated for years, FB. In 2003, NASM generously allowed a group of Vought retirees to transport the V-173 thru six states (!) to Dallas where the eighty-year-olds are busy restoring it to its former glory, sans return to NASM. 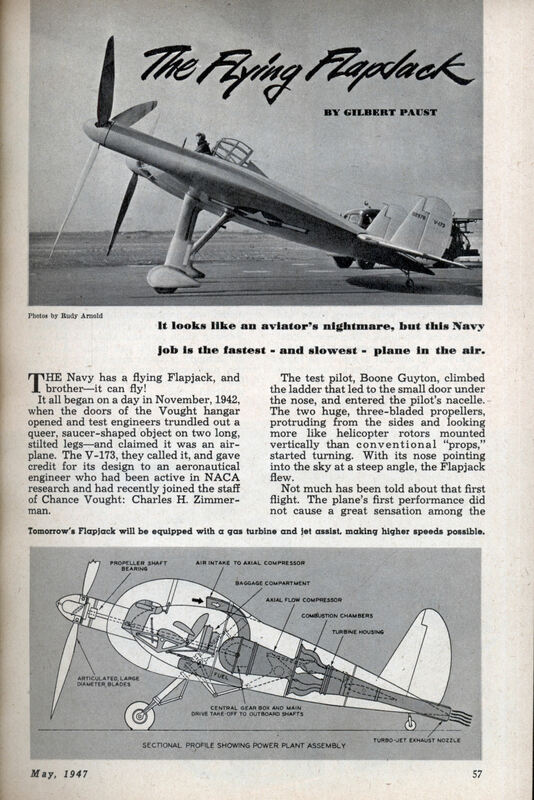 Paust’s May 1947 article promoting a mythical supersonic Flapjack (XF5U-?) inadvertantly fueled the coming public obsession with flying saucers. Ironically, the only real saucer-shaped program was redundant on March 17th – unbeknown to Paust. 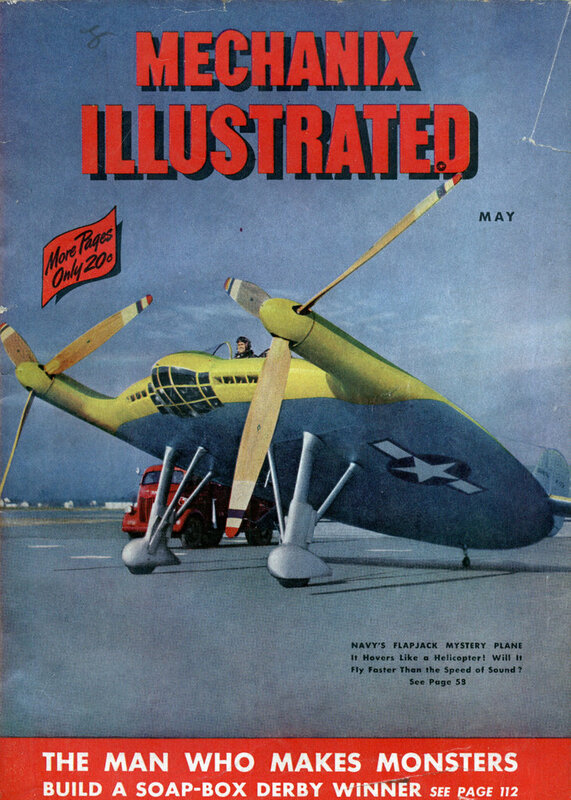 FB – have you come across an article on the V-173 by Vought’s Test Pilot Boone T Guyton? I think it was called, ‘The Ups and Downs of the Flying Pancake’, circa 1950.